If you’re partial to a chicken korma, vindaloo or balti then you’re doing your tastebuds a disservice. So claims celebrity chef Dipna Anand. 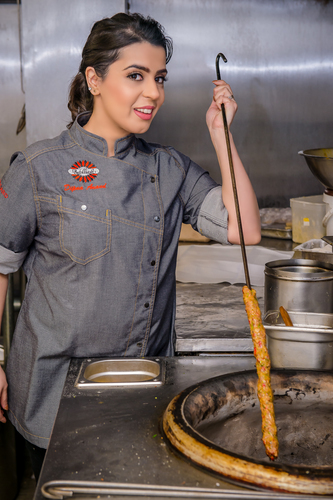 To mark the start of National Curry Week (9th October to 15th October) she has revealed her top 5 dos and don’ts when ordering at an Indian restaurant and the one dish guaranteed to be made fresh daily. And while Dipna is happy to concede that a chicken tikka masala is now a deserved curry staple on Indian restaurant menus in Britain and India, she is not so complimentary about baltis, vindaloo and kormas. Dipna, who co-owns the award-winning Brilliant restaurant in Southall, West London, which has been praised by fellow celebrity chef Gordon Ramsay and also has the royal seal of approval – it’s Prince Charles’ favourite and Princess Anne and Camilla Parker Bowles have also both dined there, said: ‘In my opinion the British public is now very educated about Indian food and understand the variety available. When they look at an Indian menu they know what they want to order and are also willing to try something new. Dipna, who recently opened a new Fulham, London restaurant Dip In Brilliant, reveals her top tips below and why a biryani should be your top choice. 1. While we accept chicken tikka masala is now a staple, there are really only two authentic chicken dishes at Punjabi Indian restaurants: chicken masala and chicken methi. Anything that is called a madras, balti or vindaloo will not be authentic. These are made up names and dishes that have probably been made using ready made curry paste. 2. Avoid samosas as a starter. These are usually bought frozen and then deep fried before being served. 3. Steer clear of sundaes as they will probably be ready made. Better to try the traditional sweets, ras malai (a type of cheesecake) and gajar halwa (a carrot based dessert). 4. Be wary of menus with too much choice – one that lists a 100 different types of curry means it is unlikely many will be fresh. 5. The one dish guaranteed to be fresh is a biryani. The rice-based meal takes a lot of labour and has to be prepared fresh daily. This press release was distributed by ResponseSource Press Release Wire on behalf of RM Publicity in the following categories: Food & Drink, for more information visit https://pressreleasewire.responsesource.com/about.